My father served in Vietnam in the late 1960s. When he came home, he was spit on and called a baby killer. He was one of too many. Everyone hated him and everyone that put that uniform on. That was a horrible time for our military. As our country engages more and more across the world, spreading our military might too thin, their overall support dwindles. I watched as everyone wore their American Pride well during the First Gulf war in 1989. But the political landscape capped that quite well – “It’s all about the oil.” Everyone listens to the media. And then one horrible day that has spread across the world, 9/11 ripped through our lives, everyone’s lives. And our national pride soared once more. For a while, anyway. And then everyone started listening to the media again. The spun any part of “The War on Terror” as a waste of money, Bush’s War, the daily death count. I was confused when the new phrases came out – “Where’s the weapons of Mass destruction?” No one could think that a plane would be a weapon of mass destruction, or bio-weapons. All they cared about was seeing the nukes. Where were the nukes? Unfortunately, we gave them plenty of time to get those out of their country. And when we couldn’t produce a cache of weapons that the media wanted and the fact that we weren’t getting out of there any time soon, the phrase changed to, “Support our troops, but not the war.” How can you support that which engages in the thing you don’t like? It was a complete conundrum for me that still leaves me scratching my head. Just ugh. Why do we continue to hate on our military? According to a report released in March 2016 by the National Center for Veterans Analysis and Statistics, the greatest number of Veterans still comes from the Vietnam Era, closely followed by peacetime only Veterans and then The First Gulf War. Yet, everyone focuses their attention, and money, on those Post-911 veterans, which only account for 13% of the total number of Veterans in that census. And yet, they are the ones who receive the attention, the focus, the help. They are the ones that all the charities gear their marketing efforts towards. In 2014, there were 19.3 million veterans living in the US and PR. Of those 19.3 million veterans, only 3.8 million have been awarded a service connected disability. Other statistics include: 7 million served in Vietnam, 5.5 million served during the Gulf War era (representing service from August 1990 to present), and 2.5 million served in Iraq and Afghanistan. Now, when I say that 2.5 million served in Iraq and Afghanistan, I’m sure that is an accurate number in the sense that there were 2.5 million people deployed to those areas. However, it is a well-known fact that of those 2.5 million people quite a lot have been on multiple deployments. So, in essence, there aren’t 2.5 million veterans of those two wars. The RAND Association explains it best – in troop years, rather than number of deployed. At present, I have been unable to locate the exact number of Iraq and Iran Veterans. However, RAND is stating the strength of approximately 554,000 soldiers in December 2011. The VA is reporting that it has seen approximately 860,000 Iraq and Afghanistan veterans utilizing their Health System. As the US Veteran population ages, the older generation numbers will dwindle. This is only natural. But with our continuing efforts in Iraq and Afghanistan, the number of veterans from these two areas will undoubtedly surpass the Vietnam era. I am in no way trying to downplay the younger generation of veterans. By no means. What I am trying to point out is that Every Veteran Matters. And that’s how ALL these benefits/charities SHOULD be run. But they’re not. I lived through my husband’s combat deployment. He experienced it. Still experiences it. Every. Horrible. Moment. And how many people remember Kosovo and their atrocities? Only those who went there in the beginning. So why is it that only the latest veterans, those post-911 combat veterans, are the only ones to get any benefits, any assistance, anything from anyone? We are not ones to ask for assistance or help. We are those people who would offer up our help to others, no matter how bad off we were. But this last year has put us in a bind. With my medical insurance premiums and cost going up, the services and prescriptions covered going down, we’ve pretty much wiped out our savings. The VA hasn’t paid for any of the procedures he’s gone through since they stopped working back in 2012 or so. I can’t remember the last time he went. They don’t pay for any of his pain medications. So we are forced, now, to go seek civilian help. He’s been going to a civilian neurologist since we moved to Florida and he’s been doing Botox injections in his neck and shoulders for his dystonia. For the past two years, all we had to pay for was the doctor visit for this procedure. Now, we have to pay for the Botox and the doctor visit. At $1000 every 3 months, that’s a no go. So he hasn’t had this since October of 2015. His pain is ever-increasing. I did some digging and found out that now the VA Pain Center can do the Botox injections for him. I also want him to try ketamine infusions, as it’s helped a couple of people with their chronic pain that no pain medications have been able to touch. So he had to fight to get that referral reinstated and he had his fist consult with the VA Pain Center in May 2016. Despite having previously been seen there, with quite a few procedures that eventually failed, and records to show for it, the evaluating “doctor” decides to “try” a procedure he had, that failed, twice, since he hadn’t been there in several years. He kept trying to say it was “new” when it really was the exact same procedure he’s had there before. We are convinced he was fishing to get TheHubs to say, “no, I don’t want to do that” just so the VA could deny him benefits because he refused a recommended treatment. But TheHubs suffered through this treatment in June 2016, which seems to have made his pain worse. They have scheduled his Botox injections for the end of October 2016 (a full year without Botox, so it’s like starting completely from scratch.) And to top it off, they can only inject HALF of what he was getting in the civilian world. HALF! How the heck is that even going to help when his full dose only took the edge off the pain!? Not only do we have to deal with all his VA and civilian doctors, TheBoy had to have surgery on both his feet last year. Now he’s in braces, which we are still paying on. And, of course, my medical issues. And last month, our A/C died. At 95 degrees, in Florida, you don’t want your A/C to die. I had just emptied out our savings to pay off all the medical bills and then this happened. Everyone in my support groups were great, giving me places to apply for assistance, in the hopes that someone, somewhere could help me with the payment of a brand new A/C handler and compressor. Out of about 35 organizations I tried, only 2 were open to all eras. But both of them were out of money. Everywhere else, you had to be a post-911 combat wounded veteran. I was crushed. All the charities I see out there, helping people with all kinds of needs and assistance, and we don’t qualify. Just like the VA Caregiver Program or any of the “automatic benefits” these veterans get without having to fight for their compensation Retreats, discounts, even a day at an amusement park (even *if* he could go with all those people) are not an option for him. Heck, even just a simple tool box for veterans, and we were denied. Nope, we have to fight tooth and nail for everything he deserves. He has always called it “The Forgotten War.” I understood it. But now, I am seeing it as “The Forgotten Veterans,” too. It breaks my heart. And what about my dad? He had to wait 30 years before the government would even acknowledge the fact that they used Agent Orange. Luckily, now they have automatic diagnosis that fall into the Agent Orange category. But, really, any assistance that my mom might need, like the Caregiver Program, is lost to her as well. I just can’t believe that we are a NATION OF NOW, a reactionary force to whatever happens to be in your face at the moment. And since the Iraq and Afghanistan wars are still ongoing, because the returning and broken veterans are so young and so plentiful, more people see them, see their wounds, and want to help…them. I want to know where we can go for ALL era veterans. I want to know why we continue to discriminate and forget about those that came before. I want to know why we can’t recognize and help them too! This is only a small portion that adds to the 22 veterans a day that die by their own hands. I only hope I can keep his hope from fading! This entry was posted in Caring For My Veteran, Emotions and tagged #22aday, #EndTheStigma, Army, caregiver, lonely, Never Forget, PTSD, stress, support, VA Process, veteran, Veterans Affairs, Vets on July 27, 2016 by LadyJai. I contacted the VA Under Secretary, in hopes to either speed up the process or at the very least, let them know about the gobbledygook woman that did his C&P. Again, they just “passed the buck” on the whole thing. We did get an “update,” if you want to call it that. STATUS OF APPEAL: Your husband’s appeal began in July 2011 when VA received his Notice of Disagreement. BVA VIDEOCONFERENCE HEARING: On 07-24-14, a videoconference hearing with the Board of Veterans’ Appeals (BVA) was requested. The next step in the appeals process will be the scheduling of that hearing. Your husband will be notified in writing of the date and time of the hearing. A hearing is not required. The wait for a BVA videoconference hearing can be long as there are limited slots available. The St. Petersburg, FL Regional Office – which is where the hearing will be held – received many requests for BVA videoconference hearings prior to your husband’s July 2014 request. Those requests are filled based on date order. APPEALS BACKLOG: The appeals backlog is large. Regional Offices and the BVA are working those appeals based on the date they were received. I apologize for the long wait which I know can be frustrating. The Under Secretary has repeatedly requested additional resources from Congress to help VA work appeals more quickly. If your husband does not fall into one of the above categories, then his appeal will continue to be worked in date order. That means it may be a few months to many months to even more than a year before the next step in the appeal, which is the scheduling of the BVA videoconference hearing. Again, I apologize for the long wait – but I want to give you a realistic timeframe. CHECK STATUS OF APPEAL: To check on the status of the appeal, please call 1 (800) 827-1000. Your husband’s representative, Disabled American Veterans, can also provide updates and assistance. I hope that this information is helpful to you and your husband. As noted above, the next step in the appeals process will be the scheduling of the BVA videoconference hearing. Your husband will be notified in writing of the date and time of the hearing. This waiting is expected. I grew up in the military. Everything was hurry up and wait. But this is absolutely ridiculous. Let the “more waiting” ensue. This entry was posted in VA Process, Veterans Affairs and tagged Appeal, Army, Congress, Military, PTSD, VA, VA Process, veteran, Veterans Affairs, Vets on January 13, 2016 by LadyJai. While today marks a day we will ALWAYS remember, while we recount the stories of where we were that day, while we share in the patriotism that brought us all together, I wanted to shed a little light on how that day STILL affects some of us. We weren’t at Ground Zero. But it doesn’t mean we weren’t affected — all those who witnessed the terror, all those serving in the military, or joined up to serve because of that day. How it still affects us all. He was full-time active duty Army at the time. When the 2nd plane hit, he told his troops, “Pack up, guys. We’re going to war.” They spent the next 3 months readying themselves for war. I worked in the 3rd Corps war room (contractor for their secured network) and I watched as his unit’s orders came, got canceled, came again, and then canceled again. Over and over my heart wrenched and relief surged only to be yanked away again. It was a very stressful time for all of us. For him, though, he *wanted* to go. To do his duty. He was denied the First Gulf War and Somalia as he was needed on the home front to train lieutenants before they were shipped off. He felt like a failure because he didn’t do what he signed up to do. Then, Kosovo happened and he deployed. No one remembers *that* “war“. He didn’t feel as though he fulfilled his destiny there either. Because 4th ID was chosen to go to Afghanistan before 1st CAV, he was again denied his duty (in his eyes). And again, he still feels like a failure, that he’s not a true soldier. He feels guilty for being a veteran, for having all the things he suffers because of some dumb “wag the dog” stunt that no one remembers, for missing out. 9/11 is a very conflicting memory in our household. While we love that it brought ALL Americans together as one, regardless of race, creed, color…it also means that my husband missed his chance to be the hero he always dreamed. I hate seeing him in pain, both physically and emotionally. I hate that he cannot see himself like I see him. And I wish others could see him the way I see him too. To this day, that war overshadows everything about him. If you’re willing, I would love to hear your stories as well. Share with everyone so we never forget that day and its lasting affects on us. Where Were You When The Towers Fell? 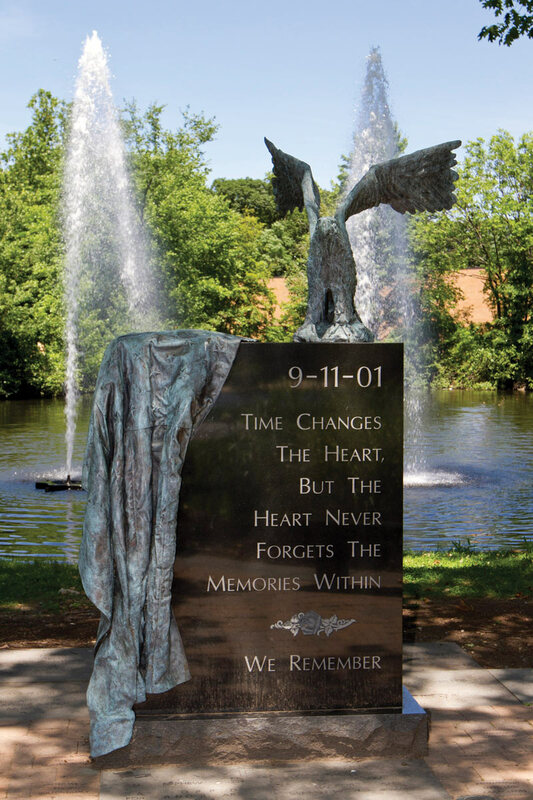 This entry was posted in Caring For My Veteran, Emotions and tagged 9/11, Army, Flight 93, Military, Never Forget, Pentagon, Remember 911, support, Twin Towers, veteran, Vets on September 11, 2015 by LadyJai. I’ve been trying, for two months now, to find the contact information for Secretary Bob McDonald. I’ve had one person offer help with our claim because she had his “cell phone number” and would “gladly help so no one had to go through what they had to deal with.” Yeah, after 3 attempts to contact her different ways with no response, I’ve given up on her. I sent the second letter to Rep. Ted Yoho on 6 February 2015 and haven’t heard anything back. Yeah, I’m beginning to think there’s a conspiracy to cover up anything dealing with the VA. So much for their “TRANSPARENCY.” UGH. Sent them both a tweet about it. No response. Went to the Senate’s Facebook page but the option to post on their page has been disabled. Went to the House’s Facebook page and asked about the 404 error there, and tagged the Senate’s account. Now we wait to see if they respond. Yes, I’m getting very, VERY frustrated. Today was a complete waste of time and effort. So many things I WANT to do but I spent most of it lost in google and government red tape. Someone in another offered to help with our claim issues and never followed through. I also haven’t heard back from my Representative I wrote to a month ago. So I decided to see if I could look up Secretary McDonald’s contact info. No luck there either. Then, I went to the House AND Senate Veterans’ Committees and their contact us form. One gave me a 404 Not Found error. The other, Access Denied. I thought maybe it was just the browser, so I tried another. Nope. Me thinks there is a conspiracy! I tweeted both of them. No response yet. I went to their Facebook pages. The Senate Committee page doesn’t allow posts from followers. But the House one does. I commented about their web page issue and tagged the Senate in that same post. No response yet. So frustrated. I guess we are supposed to be patient and wait, even though we’ve been doing that since 2003. I guess we aren’t meant to be lucky like everyone else. I guess pain and suffering in more ways than just what he’s going through is our lot in life. I should accept this. But I’m not going to stop. I will continue to try to get my heart hurt because that’s what I have to do. If I don’t do it. He will give up. It just reminds me of the story of Job in the bible. There’s always hope. Right? I received an offer to help from one of the admins who was “connected.” Four emails later, and started feeling a bit better. I’ve sent the letters to Senator Ted Yoho, the House & Senate Committee several more times since February. I have heard nothing. What else can I do to get this going? I know I’m supposed to “Hurry Up And Wait.” That’s been the military motto my father drilled into my head since I was a baby. You’d think I would understand this by now. Logically knowing this is so very different from actually practicing this. We have certified your appeal to the Board of Veterans’ Appeals and are transferring your VA records to the Board in Washington, D.C. The Board will notify you when it has received your records. 6/22/2015 – Certified the appeal and sending records to the Board of Appeals in DC. You can see how frustrating waiting can be! In the mean time, I continue to advocate for him, anyway I can. But I’m running out. If anyone has any more ideas I can try, I am open and willing to listen. Please send them my way. I have finally found Secretary Bob McDonald’s phone number, which I will leave here for anyone else; but I think I might be too chicken to call him. I wouldn’t even know what to say. I write better than I speak. This entry was posted in VA Process, Veterans Affairs and tagged Appeal, Army, Congress, Military, PTSD, VA, VA Process, veteran, Veterans Affairs, Vets on July 8, 2015 by LadyJai. A week and a half ago, I was approached by someone on my blog asking me to email him because he had something to ask me. I’m paranoid by trade and by upbringing. Not only was I a BRAT and an Army wife, where we are raised to understand OPSEC and how to become a hard target; I also work as an IT Security Consultant where I am extremely aware of spam, phishing, vulnerabilities, identity theft, and cyber bullying. Heck, I’ve had to track down and contact a couple of people who were using my email address to set up accounts in their name with their personal identifying information, to include a credit card. Had I been a bad person, I could very easily have ruined a few people’s lives. But I’m not. (you can read about this here, in my article called Am I A Victim? – Reverse Social Engineering). Anyway, as I was saying, I’m naturally paranoid when something like this comes my way. I googled his name and email address. I looked him up on Facebook. Everything pointed to a legitimate plea. Even my first impression of his request gave me a hint to legitimacy due to the way it was written. But, I always err on the side of caution. I asked TheHubs. I asked a friend. It took me all day to weigh the odds. I even set up a secondary email address, just for this blog before I emailed him. What I had found out about Mr. Von Saint James was accurate. And it was a legitimate email with a request for help. He told me what he wanted and I agreed. It was a no-brainer. Nine years ago, Heather was diagnosed with mesothelioma; a rare cancer caused by exposure to asbestos. She had just had a baby and was given 15 months to live. After surgery to remove her left lung, Lung Leavin’ Day was born. Heather continues to survive. This is her 9th LungLeavin’ Day celebration! The purpose of this holiday is to encourage others to face their fears. Each year, they gather around a fire in our backyard with their friends and family, write their biggest fears on a plate and smash them into the fire. They celebrate for those who are no longer with them, for those who continue to fight, for those who are currently going through a tough time in their life, and most importantly, they celebrate life! You can see Heather’s interactive page mesothelioma.com/heather/lungleavinday that tells the full story of their special day. After reading their story, so many fears came flooding back. This, THIS is one of our biggest fears. Mesothelioma is not pretty. And usually, it’s a death sentence. TheHubs was a heavy-wheeled mechanic in the Army for 13.5 years. The first nine were spent in an asbestos insulated motor pool changing out asbestos breaks on military vehicles. Normally, a tour in the Army lasts 3 to 4 years. Unfortunately, the way the paperwork went for him during Team Spirit, The First Gulf War, Somalia, and a couple of cancelled PCS moves, he ended up staying in the same unit, at the same post, in the same motor pool for 9 years. This is unheard of. He watched three or four rotations of personnel while he stayed. The thought of cancer from asbestos always tickled the back of our minds, but it was what it was and there was nothing we could do about it. It wasn’t until the Army contracted a company to survey the motor pool, remove the asbestos from the building, and then document all the personnel into some national database somewhere (they never told us where) did we start to figure it was serious. There was a problem with the contract, too. They only removed the asbestos from the walls. The ceiling remained untouched. TheHubs remembers having the insulation falling from the ceiling every day but nothing was ever done, even after the “renovation.” At least, not while he was there. We moved on. The Army stopped using so much asbestos in their brake parts. They renovated the old buildings. But honestly, I don’t trust much of the “renovations” anymore after the motor pool fiasco, and after so many contracts I’ve worked on over the years with the government. I have seen and experienced so many things, how can I trust the government? Over the last 5 years, we’ve seen so many lawyer ads on the TV about Mesothelioma that it’s constantly in our face. We know that it can take between 25-50 years to manifest, IF it manifests. Well, we are now at the 25 year mark from his first exposure. And now we learn that you can contract this through second-hand exposure. That means, even MY chances of contracting Mesothelioma are great because he would come home and I would snuggle up with him while he was still in uniform, and I washed his clothes. Not only that, now that I look back, I’ve lived and worked in government buildings since the day I was born. Even today I wonder if about the place I’ve worked for the last 12 years. My co-worker dried her hardest to have a fish tank here. Everything died. Even when she used distilled water, everything died. She took it home and the fish thrive. Makes you wonder. I mean it is an old WWI building. It was even considered a Fallout Shelter once. The sign has since gone missing. I always wonder about sick office syndrome because of all this. But now, I wonder about asbestos in all those other military buildings I lived and worked in. Only time will tell. We just keep praying that it will not bless us on top of everything else that bless our lives. We’ve already had to deal with lung cancer in our family. My father was diagnosed with lung cancer on September 11, 2001, the same day the Towers Fell. It was not due to his smoking, but it scared him enough to quit (for a little while, anyway). My father was exposed to Agent Orange during Vietnam. That’s what caused his cancer. There’s always hope in the face of darkness. I will always hold on to these stories. They will get me through if ever we are blessed with Mesothelioma. This entry was posted in Caring For My Veteran, Emotions and tagged agent orange, Army, asbestos, cancer, caregiver, emotions, fear, feelings, lung cancer, mesothelioma, Military, not alone, positive thinking, support, veteran, Vets on February 24, 2015 by LadyJai. I guess it’s about time to update you on our VA Claim/Appeal process. Last time I wrote about the VA Scandal and where it got us. I was so excited to see that Washington actually took our story and made movement on it. My veteran was getting all kinds of calls for a week or so and each time they told him that they couldn’t do anything until such-and-such department made their decision. were currently going through the appeals process with VBA. We apologize for any misunderstanding that may have been caused. Why do they continue to only focused on the PTSD portion of his claim? He’s been told he missed the PTSD qualifications by 2 points. Ok, fine. He doesn’t qualify for PTSD. BUT, the VA found, during that C&P exam that there is evidence of depression and mood disorder and his VSO clearly defined the precedence in his NOTICE OF DISAGREEMENT SUBMITTED ON 7/8/2011. That was 2 and a half YEARS ago! And they STILL ignore it. I also applied for the VA Caregiver Support Program in May of last year. Some caregivers told me it took them a month, while others told me it took them a year. I’ve given it a while now, somewhere in the middle, and decided to check up on my request. After many calls to many different people, we found that the national office had attached it to my file but never emailed the Caregiver Support Coordinator. When she found it, she apologized profusely and said she’d do what she can to get this pushed through as fast as she could. A few days later, we had our eligibility appointment. I just received a call from the VA Caregiver Support Coordinator telling me that we qualify based on his mental health. However, there is no record that it’s service connected. I proceeded to explain to her that it’s still in the claims/appeals process that we’ve been fighting for years over. She informed me that if/when we receive that service connection, to contact her and she will get this pushed through again. This is just our luck. What a kick in the teeth. So now the scramble again, to get this ball rolling. I’ve contacted Rep. Ted Yoho again with a second letter. We’ll see how that goes. And TheHubs is trying to contact his VSO about this. Since he’s always so busy, he had to leave a message. And the waiting game continues. This entry was posted in VA Process, Veterans Affairs and tagged Appeal, Army, caregiver, Congress, Military, stress, support, VA, VA Process, Veterans Affairs, Vets on February 10, 2015 by LadyJai.